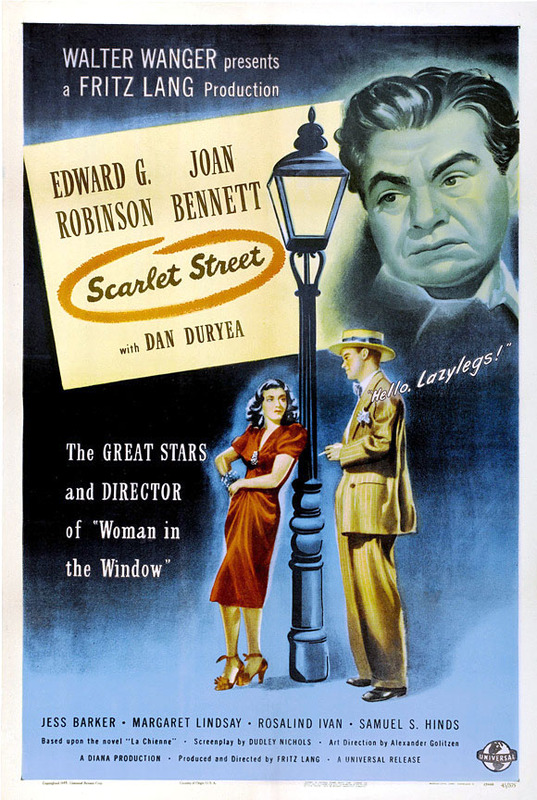 Similar to Woman in the Window, this film-noir was directed by Fritz Lang and it stars Edward G. Robinson, Joan Bennett, and Dan Duryea. Chris Cross is a shy employee who has been working for the same man 25 years. While walking home Chris rescues a beautiful woman from an assailant, not knowing it is her brutish boyfriend. Amused Kitty agrees to have coffee and Chris who is an amateur artist, begins talking art, but Kitty gets the idea he is a wealthy painter. Because Chris is stuck in a hopeless marriage he becomes infatuated with kitty and she takes full advantage. Chris scrounges for money to pay Kitty’s rent and unbeknownst to him, Kitty’s boyfriend tries to sell the artist’s work. A critic is impressed and so Kitty masquerades as the artist. Chris finds out eventually and confronts her but the conniving femme fatale manipulates him again. Chris is delighted his work is appreciated and he is content with Kitty continuing to take the credit. An unexpected turn of events mean he can leave his wife and marry Kitty finally. However, he finds her with Johnny and after his genuine proposal she belittles him.An enraged Chris commits murder but it is pinned on Johnny. A miserable wanders the streets without a job or recognition for his art. Furthermore, he must live with his guilty conscience tormenting him until the end of his days. Woman in the Window is good but this film is more biting and powerful when it is all said and done. This entry was posted in 1940s, Crime, Drama, Film Noir and tagged Dan Duryea, Edward G. Robinson, Femme Fatale, Fritz Lang, Joan Bennett by 4StarFilmFan. Bookmark the permalink.